Waiting for Mary, day 2 - Stop staring and start sewing! Well no magazine today, sigh. But I did keep busy nonetheless. I got a couple cuties shipped out that I want to share. I made this cute little bloomer/skirt combo for a very nice customer who bought a dress made from this fabric for her oldest daughter last year and has since had another little girl. She wanted some matching bloomers and I was tickled to oblige. I took a simple little bloomer pattern and added a skirt. 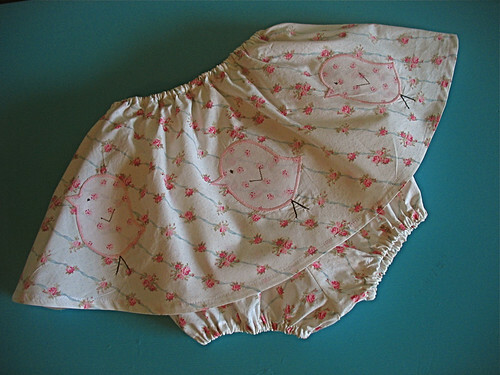 I only had a tiny amount of the pink fabric left so I made these little birdies across the rump and aren't they cute? 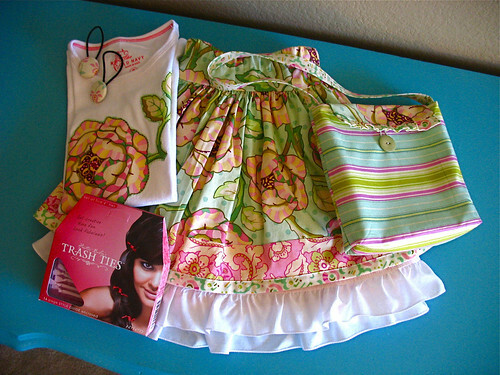 The fabric is kind of crinkly (or "shabby", ahem) because it's from Rachel Ashwell's sheets. I love the little stick legs, I hope she does too. I also shipped these beauties to the winner of my drawing. This was really fun to make and I'm happy with the way it turned out. Fresh fresh baby! In the spirit of Mary-ness I want to share something fun I used to do with my girls. 10 years ago they were all little and they were so excited to discover that each MEHC magazine comes with a beautiful paper doll and it didn't take them long to help themselves to the first one. 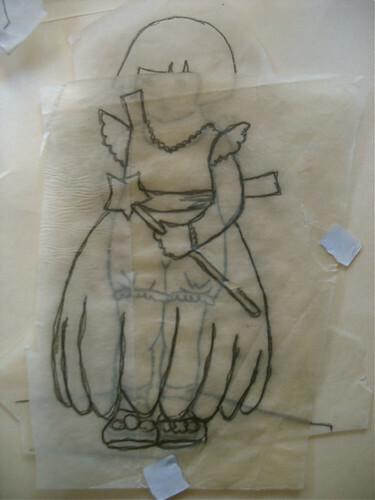 I was so mortified that they had taken it (I mean what would little girls want with a cute little paper doll anyway??) and realized I had to come up with a solution if I was going to keep my collection intact. 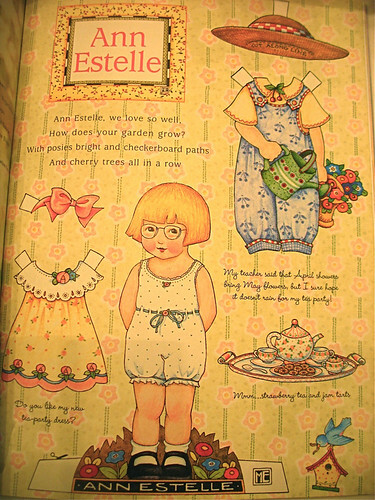 Here's Ann Estelle from the April/May 1997 issue. Isn't she cute? And those clothes! 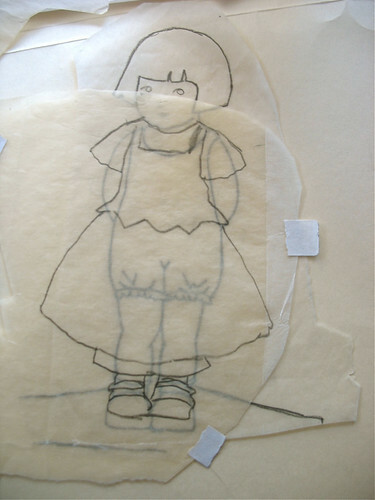 I started tracing the dolls and clothes onto vellum and then I would copy the dolls onto paper stock. I colored them in so they looked almost as good as the originals (using Mary's pen and colored pencil method that I read about in one of her books). 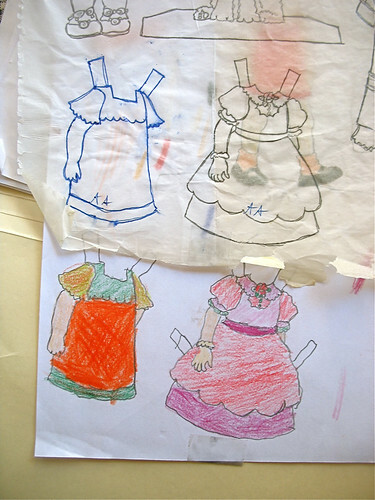 Then I let the girls copy the dresses, pets, and accessories using whatever colors and designs they wanted. 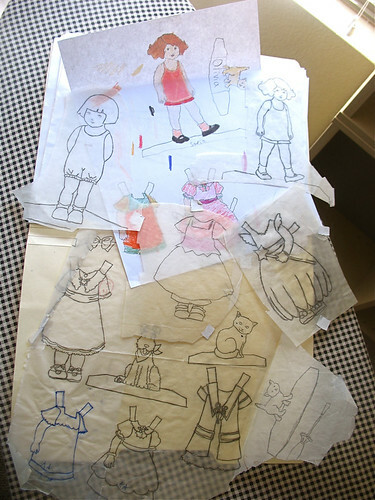 I don't have the paper dolls I made anymore but I managed to hold onto the pictures I traced. Here are a couple that the girls colored. We shared hours of fun with these and I got to keep my collection. Maybe when I have grandchildren I'll be a little more willing to part with them. But I doubt it.